Coffee and tea connoisseurs know that some of the best made hot drinks involve a lot of care and the process cannot be rushed. Manual pour over coffee is almost impossible to get perfect if you use a traditional gas top or electric kettle because the standard thick spout allows too much hot water to pour out at a time. The fast flow doesn’t allow the coffee grounds to come in enough contact with the water before it passes through to the cup below, so the brew will taste weak and even the best freshly roasted coffee beans won’t be able to save it. Same goes for tea leaf brewing, where even though the leaves have to steep for a while in the water, that water should be poured slowly and gently over the leaves. That’s why having the best electric gooseneck kett8le instead will give you precision control over pouring. A gooseneck pour over kettle has a very thin and slightly S-shaped spout and this design slows the flow of water through it. The thin stream that you get allows for more control over the distribution of the water over the grounds. When this works alongside a good manual pour over dripper that holds the coffee grounds that need to be soaked, the resulting extracted brew is more likely to be full flavored. While there are some stovetop choices as well, an electric kettle is more convenient if you don’t want to babysit the boiling everytime. For safety, the kettle can turn off once the water reaches a boil and some models even let you select a lower desired temperature if you don’t want it to reach a boil, which is ideal for certain types of teas. Our electric gooseneck kettle reviews below will cover both kinds. One thing to note about a gooseneck spout is that the pouring technique can be easier to master with some kettles than others. This is because the tip of the spout dictates the angle at which water pours out. If it pours like a waterfall over the edge at 90 degrees or if it pours straight down into the grounds when you tilt the kettle, it is easier to control the flow. However, a badly designed tip on a pour over coffee kettle that directs the flow out at an angle makes mastering the distribution more difficult. Even the best gooseneck electric kettle needs to be taken care of and that means regular descaling with a powder to prevent hard water deposit buildup and flakes making their way through into your brew. This will also keep the thin spout free of blockage. Another way of cleaning a gooseneck kettle is to boil some white vinegar in it. Any discoloration will disappear immediately. This high-quality, 1 liter, stainless steel kettle is perfect for coffee connoisseurs. Its long neck and perfectly tapered spout allows for a precise flow of water during pour over brewing. This yields a flavorful cup of coffee that will satisfy even the most selective coffee drinker. The 1L Will & Everette kettle’s efficient design blends safety, durability, and convenience. Its spill-free lid is not hinged, is tight enough to guard against messes and protects you from spilling dangerous, scolding hot, water on your hands. Its 1000 watt, 120 volt base, boils water quickly and safely. This leaves you free to conduct other tasks while it brews. Its automatic shut-off feature powers the kettle down when it is finished. This kettle was designed with great care and may just be the best kettle for pour over coffee. The lid is easy to remove for quick cleaning and the ergonomically designed BPA-free handle features a subtle ridge on the inside so that it doesn’t slip from your fingers, making it comfortable and safe to hold. Customers have generally been very satisfied with this kettle. They really appreciate the speed with which it can bring water to a boil and how precise and controlled the pouring is. They also feel that this kettle holds a large capacity despite its petite frame. The water will stay hot for 10 to 15 minutes after it shuts off. One or two complaints have been that water leaks from the bottom of the kettle, near the power switch, but this seems to be from a few defective units and not from a design flaw. This Zell Precise Thin Spout kettle is for people that value portability. It has an 800 ml capacity and the kettle lifts off the heating element for easy pouring. It is very fast to bring water to a boil because of its powerful 1200 watt rating. The lid is hinged and opens by just the press of a switch. The stainless steel is resistant to rust and corrosion, and there are no complaints of occurrences of either. Its slip resistant, ergonomically designed handle puts this among the safest kettles on the market. It has an auto shutoff that works once the water reaches boiling point and the red indicator light stays on only when the water is being heated. The most common complaint against this mini gooseneck kettle is the design of the gooseneck spout. Many feel that there are other models that make pouring easier. The real selling point of this kettle is its light and compact size. When pouring a full kettle, you don’t want it to be too heavy because pour over coffee making takes time. It can be used just about anywhere to make great tasting hot beverages. The Elementi gooseneck kettle is for coffee and tea drinkers that want good control with their pour over kettles. This 1 liter unit touts a precisely designed neck for ultimate pour over control. Customers really appreciate the level of pour control that this kettle offers, resulting in a flavorful cup of coffee. Its powerful 1000 watt heating element ensures that you won’t waste a lot of time waiting for the water to boil. It will bring a liter of water to a boil in about 7 minutes, which is not the fastest but is good enough for most. Its 2 foot long cord stores easily inside the base when it is not in use. The lid fits tightly to the unit and you do not have to worry about it slipping off and spilling dangerous boiling water. There is a minimal amount of plastic on the base and handle and no plastic at all inside the kettle. One of the common complaints about this kettle is the length of the cord. Some feel that the 2 ft long cord is just too short because you need to place it near a power outlet. However, being that the kettle itself is not corded but just the base, this shouldn’t be too much of a problem. If you think your coffee tastes burnt because you’ve used fully boiled hot water in your pour over, you should try to get the water to hot but not boiled. If you’re a tea drinker, then you should know that different types of teas are best when brewed at a specific temperature instead of at boiling temperature. For both these cases, you will need the best gooseneck kettle that includes temperature control. Some models allow you to have very precise control where you can find and set the ideal temperature at which the kettle will shut off, while a few models come with presets that make it easy for you to choose the right one even if you constantly try out different coffees and teas. We also have electric kettles with temperature control but with normal spouts. This variable temperature control kettle is for the pickiest drinkers. In fact, many connoisseurs say this is the best electric kettle for pour over coffee. The control system allows you to set and keep the temperature precisely where you want it. You can adjust the temperature between 140-212 degrees Fahrenheit in one degree increments. The real time temperature display gives you strict control over the temperature. This 1 liter kettle takes about 8 minutes to come to a full boil and a big bonus is that unlike most other electric kettles, the water stays hot for up to 60 minutes. 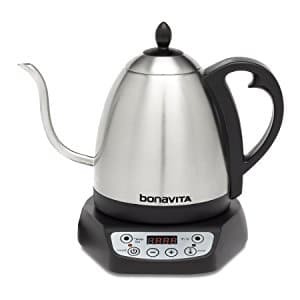 This Bonavita Gooseneck Variable Temperature stainless steel kettle should not rust but some old incidents have been reported. These instances have been attributed to a manufacturing error that has been remedied, so old complaints should be disregarded. There is a tiny bit of plastic inside this kettle but that is because of the temperature control mechanism and most of it is above the fill line. If you want a kettle with absolutely no plastic inside, choose one without variable temperature control. Coffee and tea drinkers that desire stringent control over temperature love this kettle. Many customers say that this kettle is reliable and durable. The most common complaint against it is that it stops working within 2 years. However, other customers say that they’ve been using it for many years. The majority of users believe that this kettle is worth its elevated price tag, while the rest think that it is not of good value. This one liter capacity 1200 watt Willow & Everett Electric Gooseneck Kettle makes getting the perfect cup of coffee simple. It starts at a default temperature of 212°F and “+” or “-” push button controls bring the water exactly to the desired temperature. It brings the water to a boil in 5-6 minutes and emits a chime when the desired temperature is achieved. This virtually eliminates burned, tasteless coffee due to human error. Even when the water inside is boiling the outside stays relatively cool. This is an important safety feature that can save you from potentially catastrophic accidents. Its food industry grade stainless steel resists rust and cuts a classy form on your counter top. Even satisfied customers complain about the buzzing electrical noise that this kettle emits. Overall the reviews for this kettle are good, however. Customers appreciate the precision, in both temperature and pour control, that this kettle offers. This unique Willow & Everett electric kettle with Temperature Presets is one of the few that offers preset temperature controls. It offers the same quick heating that you have come to expect from electric tea kettles. The preset feature makes pour over coffee or tea drinking more convenient than ever. Simply press the button for your desired temperature and carry on with your business. There are 5 presets ranging between 180 and 212 degrees Fahrenheit and are labeled for the various tea and coffee types, so you don’t have to remember the ideal temperatures yourself and selection can be very quick. It will heat the water to the desired temperature and automatically shut off when it reaches that. Its air tight, spill free lid ensures that your water is kept inside the kettle until you pour it over your coffee or tea. Customers really appreciate the preset temperature feature. They are a convenient way to ensure the perfect cup of coffee or tea. They also appreciate the solid design and construction. Some customers have mentioned that the lid can be too hot to touch right after it boiling so you have to wait a while before removing it. You should also take care not to pour at too sharp of an angle, or water will leak from the lid.